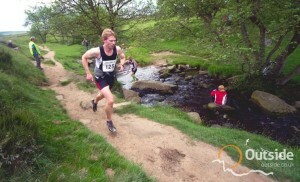 I was over near Leek at the Roaches the other weekend racing. The Passing Clouds fell race with 9.82 miles and 1,833ft of ascent to complete. I finished in 4th place with a time of 1hr 13 mins and a new personal best for that course too :-). I was however in 2nd place with around 2 miles to go and took a wrong path coming off Hen cloud to find myself lost! Finally got back on the correct path and finished the race. It even happens to me! A race closer to home (me pictured above) that I ran last Thursday evening was the Grindleford fell race with 4.5 miles and 634ft of ascent. What a brutal race that was! Straight up through The Haywood and along the Longshaw Estate with a very fast decent down Padley Gorge and finishing with a flat and fast section through fields along the Derwent Valley. Final river crossing before finishing at the Cricket pitch. I managed to finish 6th in 33:44.